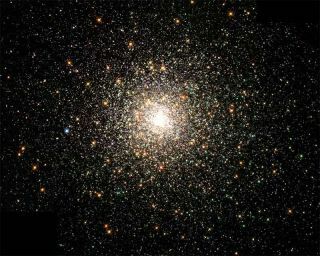 A Hubble Space Telescope image of the typical globular cluster Messier 80, an object made up of hundreds of thousands of stars and located in the direction of the constellation of Scorpius. The Milky Way galaxy has an estimated 160 globular clusters of which one quarter are thought to be 'alien'. Manyof our galaxy?s star clusters may actually foreigners: collections of starsthat were born elsewhere and then migrated to our Milky Way, according to a newstudy. Theforeign-born starclusters actually make up about one-quarter of the Milky Way globular starcluster system, researchers found. "Itturns out that many of the stars and globular star clusters we see when we lookinto the night sky are not natives, but aliens from other galaxies,"said study co-author Duncan Forbes, an astronomer from Swinburne University ofTechnology in Australia. "They have made their way into our galaxy overthe last few billion years." Astronomerspreviously suspected that some globular star clusters, which each containbetween 10,000 and several million stars, were foreign to our galaxy, but itwas difficult to positively identify which ones. Tofind them, Forbes, along with his colleague Terry Bridges of Queens Universityin Ontario, Canada, used data from the Hubble Space Telescope to examineglobular star clusters within the Milky Way galaxy. Theythen compiled the largest ever high-quality database to record the age andchemical properties of each of these clusters. "Usingthis database we were able to identify key signatures in many of the globularstar clusters that gave us tell-tale clues as to their external origin,"Forbes said. Theresearch will be detailed in an upcoming edition of Monthly Notices of theRoyal Astronomical Society. Thework also suggests that the Milky Way may have swallowed up more dwarfgalaxies, or ?mini? galaxies of up to 100 million stars, than waspreviously thought. Previousresearch has shown that two dwarf galaxies within the Milky Way areforeign-born, but the current work suggests there may be as many as six orseven. "Althoughthe dwarf galaxies are broken-up and their stars assimilated into the MilkyWay, the globular star clusters of the dwarf galaxy remain intact and survivethe accretion process," Forbes said. However,future studies will be needed to confirm this finding, the researchers said.